Many homeowners would agree that spring is the best time to clean up your home – after all, it’s called “spring cleaning” for a reason. This means you’ll probably need to get your scouring pads, sponges, brooms, and scrubbers very soon. When sprucing up your rooms, it’s important to remember that your carpets took a beating during the winter months along with the rest of the home. That’s why carpet and upholstery cleaning is one of the top priorities on every spring-cleaning to-do list. With clean carpets, you improve the overall air quality in your home by reducing pet dander, bacteria, and dust. 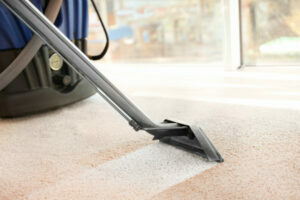 By deep cleaning your carpets, you can easily get rid of dust mites and allergens. Some people think a liquid chemical cleaner is always required but you can make your own cleaning solution at home. For a non-toxic cleaner, just mix2 tablespoons of dish soap, ¾ cup of hydrogen peroxide, 5 drops of your favorite essential oil, one gallon of hot water, 2 tablespoons of fabric softener, and ¼ cup vinegar. You can use this mixture instead of store-bought options for your rug-cleaning machine. Shag carpeting is one of those old trends that have become stylish again, so if you have one in your home, knowing how to clean and maintain it is important, as vacuums usually have too much suction and can ruin your shag carpet. One of the noteworthy professional carpet cleaning tips should help you keep your shag carpeting from shedding. Just remember to use the hose attachment of your vacuum when cleaning said carpet. It may take longer, but the process will let you get deeper into the fibers without affecting the quality and appearance of the shag. Is there dried gum sitting in your precious carpet? Don’t panic–getting it out is not as hard as it seems. Just head over to the freezer and grab some ice cubes. Use them to freeze the gum for around 30 seconds. Once the gum is frozen solid, you can use a spoon to lift it and cut the strands of the carpet as close to the dried gum as possible. The spot should not be noticeable if you only snipped off a small portion of the rug. Some grease stains won’t budge if you use ordinary chemical cleaners. For difficult-to-remove grease stains, apply two drops of concentrated dishwashing detergent and combine it with a cup of water. Put the mixture in a spray bottle and spray it onto the stain. It will cut through the grease, similar to how it does on your dishes. Blot it up to fully remove the grease. As the weather begins to heat up, it’s a sign to bust open all the windows as well as your cleaning cabinet. Doing your carpet and upholstery cleaning tasks like a pro may seem impossible, but it’s not as difficult as you think! With the above professional carpet cleaning tips, you are sure to have dirt- and bacteria-free carpet ready for the coming months. As you prepare for holiday cooking, it is the perfect time to thoroughly clean your kitchen, including the oven, refrigerator, and dishwasher. You might have your counters, floors, and backsplashes professionally cleaned, to remove stains and prepare for holiday cooking. This is also the perfect time to replace any broken appliances in preparation for holiday cooking. When your guests look over your holiday home, carpets and rugs may dominate the view, especially if they are stained or dirty. You also want your carpets and rugs to look great for family pictures and photos of gift-opening. This is the perfect time of year to have your carpets professionally cleaned to remove stains, lift odors, and make your carpets look like new. If you have hardwood, tile, or linoleum floors, these can be damaged by snow and salt tracked in during the winter months. If you plan to have many visitors walking around your home, you will want to protect your floors from damage. Update your entry rugs (or add them) and if your floors require waxing, have this completed before the winter months. Most people think of cleaning their sinks and toilets, in preparation for guests. But your visitor’s attention might be grabbed by a moldy and stained shower, floor and wall tiles, which are difficult to clean by yourself. If your tiles and grout are looking off-color or mildewed, the holiday season might be the perfect time to book professional tile and grout cleaning. Just like carpets and rugs, your couches, throw pillows, and curtains can absorb stains and odors over time. You can purchase cleaning agents and take care of this yourself, but it can be challenging work. Home upholstery cleaning can lead to discoloration and chemical residue being left in the upholstery. Save yourself time and risk by choosing professional upholstery cleaning for fresh, clean couches. If your guests are bringing small children, you will want to make your home safe for them. To start, put outlet protectors in on open electrical outlets. You may also want to install devices that make it difficult for children to open cabinets, doors, and toilets. You want your home to look nice and inviting. Remove unnecessary clutter by consolidating your belongings, and disposing of unneeded items or putting them into storage. With lots of cooking, children running around, and new traffic and activity in your home, accidents can happen. Prepare for emergencies, such as injuries, by having a first-aid kit on hand (or re-stocking your existing kit). Put together a Spill Survival Kit to deal with accidental spills and marks quickly to prevent staining. If you have a fireplace, prepare it for use over the holidays. Stock up on firewood, if needed. Purchase scented candles and matches or lighters. These will bring a warm glow to your home. Make sure you have plenty of blankets for guests, who may be staying overnight or those who just want to curl up in front of the fireplace and watch holiday movies. This is the fun part of preparing your home for holiday guests! Get your Christmas tree or Holiday decorations and put it in place. Hang garlands on your banisters and set out your decorations to get everyone into the holiday spirit. With these 10 simple steps, you can make your home warm, welcoming and clean for your guests and family over the holiday season! Area rugs can help add warmth and comfort to your home. But keeping area rugs clean and hygienic is just as important as keeping your carpets and hard floors clean. Area rugs in homes can be highly valuable, being made of quality materials and featuring artisan craftsmanship. Don’t put your precious area rugs at risk. Here are 5 reasons to always choose a professional for area rug cleaning. Just like professional carpet steam cleaning, professional area rug cleaning more effectively targets and removes dust, dirt, and germs from your area rugs. Just like other soft surfaces in your home such as upholstery and curtains, area rugs are magnets for dust and pathogens that could be floating around your home. While vacuuming helps, deep cleaning is needed from time to time to remove ingrained dirt and germs. Professional area rug cleaning can hygienically remove and extract more dirt, dust, and pathogens from area rugs while preserving their pristine condition. You can target visible stains and any residual odors. But make sure to use a professional, because a common issue in cleaning high-quality area rugs is that the color bleeds if it is not done correctly. The deep cleaning techniques used in professional area rug cleaning help to gently lift stains and remove odors for all around fresher, cleaner and more beautiful area rugs. Area rugs, Persian rugs, and oriental rugs are often intricately constructed with delicate materials and need to be handled carefully. Each area rug is different – composed of different fibers, patterns, weave, and texture. An experienced and professional carpet cleaner understands how to identify the type of area rug you have and how best treat and handle each unique type of area rug in order to effectively clean the rug and maintain its beauty. Unlike regular carpets and even upholstery, area rugs often include trims, fringes, and tassels that need to be treated and handled with care when cleaning. Home cleaning and vacuuming can often damage these trims if they are not handled carefully. A professional carpet cleaner analyzes the fiber type and weave pattern of the area rug trim as well, as these can often be composed of a different material. Following specific care processes for these trims and tassels helps to keep them clean and safe. Professional area rug cleaning offers more thorough and efficient results than any other form of cleaning. While vacuuming can help to lift some surface dust and dirt, and air fresheners or bicarbonate soda can help to cover some odors, nothing compares to the deep cleaning refreshment of professional area rug cleaning. Professional cleaning reaches deep to clean around each of the individual fibers for a more thorough and lasting result. Having your area rugs professionally cleaned is the ideal way to add some extra cleanliness and hygiene to every room of your home. We are a local professional carpet cleaning company located in Dublin. Give us a call and we can go over the specific needs of your delicate area rugs so we can find the best area rug cleaning solution to refresh your home.